Asustor is facing an obvious disadvantage; its rivals offer operating systems that have been refined over many, many years and are familiar to many customers. Yet, perhaps there's no disadvantage at all, as what Asustor has is the ability to start afresh with a new Linux-based OS built from the ground-up. 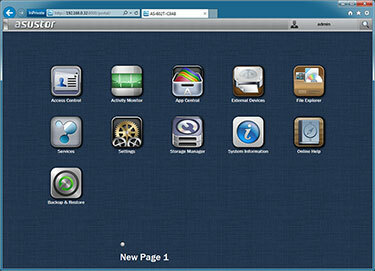 The company is calling it Asustor Data Master (ADM) and, while it offers all of the usual NAS functionality, it attempts to do so in a slightly different way by adopting an Apple iOS approach. Simplicity and ease of use is of paramount importance to any NAS aimed at the home or small-business user, and ADM ensures that every 6-Series Asustor device is easy to configure. 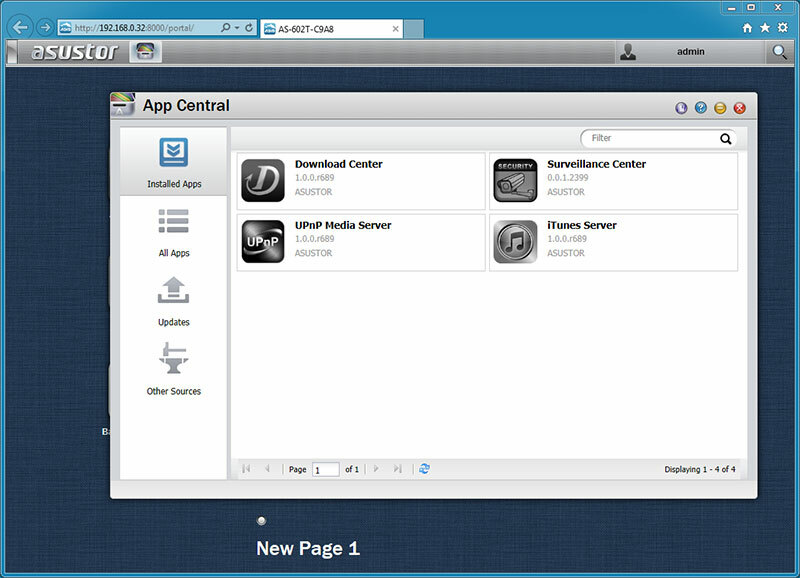 To get started, you run the bundled Control Center utility to locate the device on your network and access the initial configuration wizard. Asustor gives the user a choice of a one-click setup or a custom setup - with the latter providing granular control over certain features - but the one-click method will suit most users. 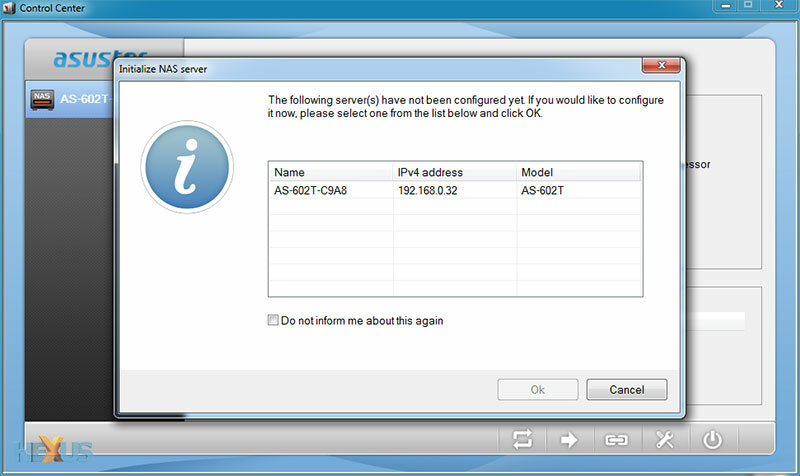 By default, it configures the NAS as a RAID 1 array when two drives are installed, sets the time to match your computer (with subsequent remote-server synchronisation), and asks the user to choose an administration password. Setup is well streamlined and the user can move on to finer configuration through the web-based admin panel while the RAID array is built. It's here that the iOS inspiration is clear to see. 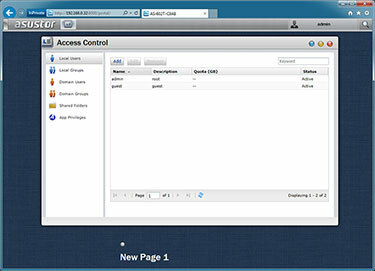 The admin panel is displayed as a grid of icons that can be moved and organised into separate pages. 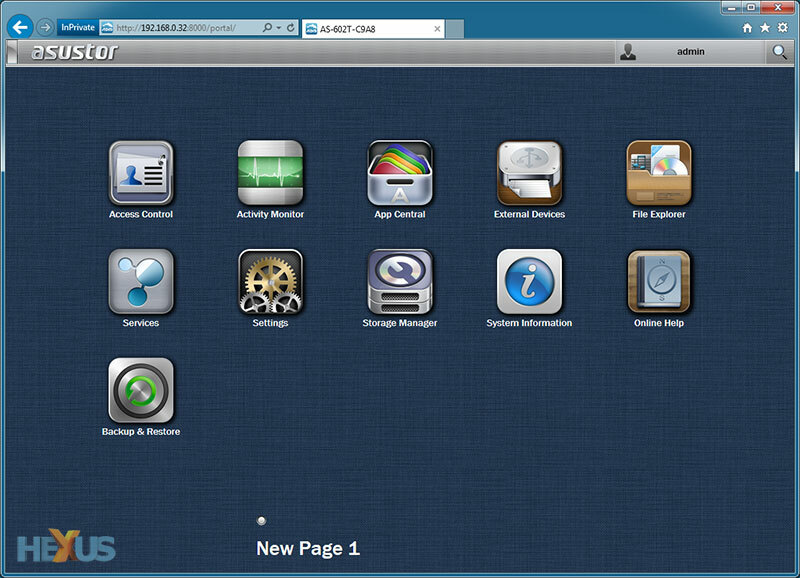 Asustor's approach is clever in the sense that the interface will look and feel familiar to anyone who has used an iPhone or iPad, and this particular layout lends itself well to a NAS environment. Each 'app' opens in its own window, and multiple windows can be opened at any one time. What's handy is that Asustor has simplified multitasking by including a Windows 8-like taskbar that allows open windows to be minimised. By taking tried-and-trusted UI elements from various existing platforms, ADM offers an operating environment that's easy to get to grips with and intuitive to navigate. 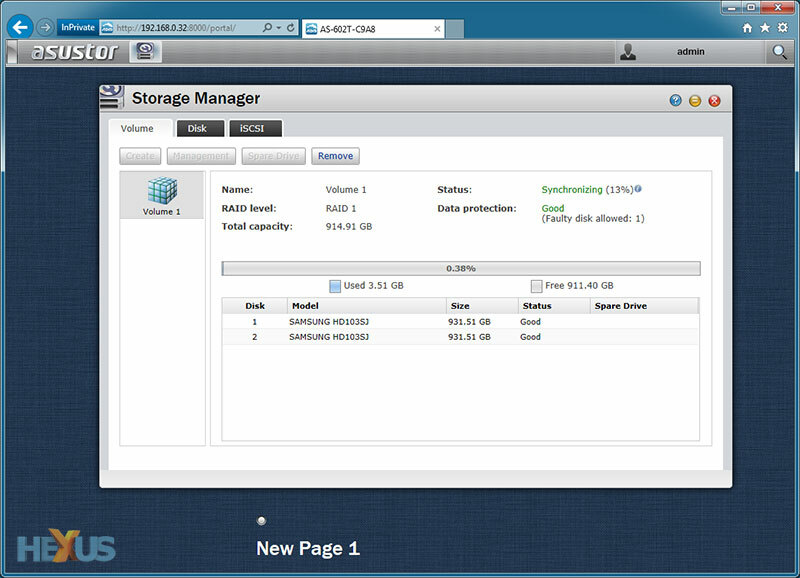 A live demo of ADM is available via the Asustor website - seeing it in action really is the best way to experience it - and as you'd expect from a NAS at this price point, a wealth of features are built in as standard. A choice of RAID 0 and RAID 1 is available to users of the dual-bay AS-602T, with support for online migration and expansion, and business features such as iSCSI targeting and Active directory support are included as standard. 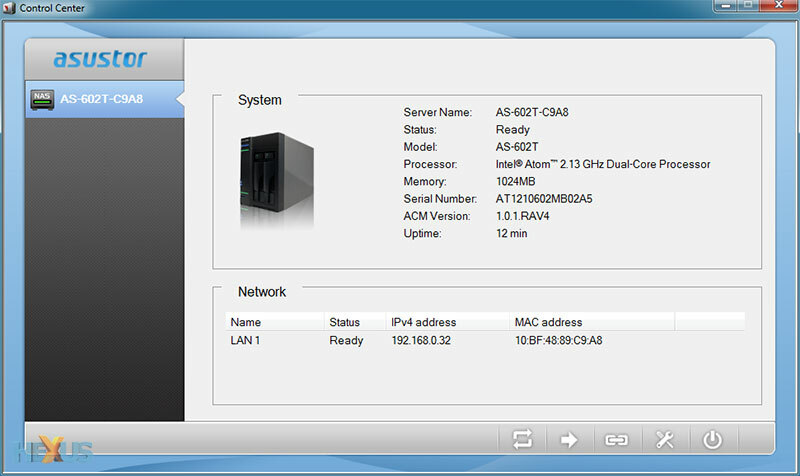 The default features work well and though Asustor is a relatively new NAS manufacturer, the software feels surprisingly polished throughout. We're particularly fond of the extensive hardware settings; users can adjust the brightness of the LEDs (or turn them off completely), disable the reset button, choose to hibernate any installed disks after a defined period of activity, manually adjust fan speed and configure a daily power schedule. 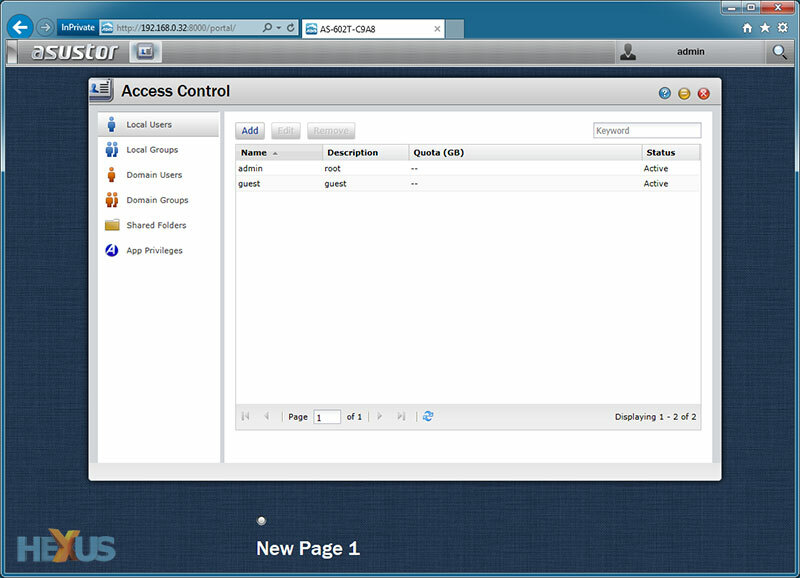 Creating multiple user accounts or groups is simple, as are shared folders, and the AS-602T supports all the required protocols for Windows, Mac and Linux compatibility. FTP functionality is also built in to the OS, and a variety of backup options are available - including remote sync, backup to an external device, one-touch copy to USB, cloud backup to Amazon S3 and support for Apple Time Machine. 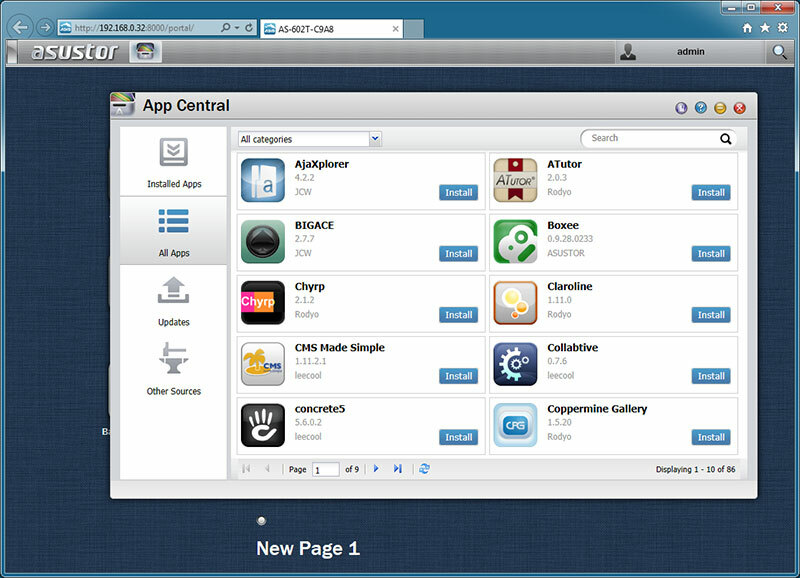 Expanding on the lengthy list of built-in features, Asustor has its own app store - dubbed App Central - that allows users to add extra functionality to their box. We weren't expecting to see many apps available, but there are 86 at the time of writing (all of which are free but require registration) and quite a few are developed in-house by Asustor. These include Download Center, Surveillance Center, UPnP Media Server and iTunes Server. The aforementioned core apps provide functionality you'd expect from a £399 NAS, but in separating such features into apps, Asustor has made it easy for users to tailor the NAS to their needs. Users looking to do more with their network storage will find that apps such as Dropbox, WordPress and Boxee are readily available, with the latter transforming the NAS into a fully-featured HDMI media player. 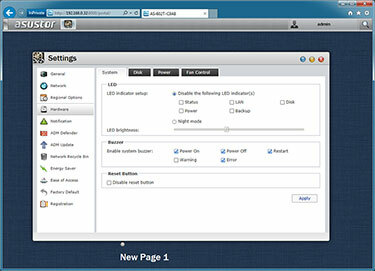 It's telling that, despite being a newcomer, Asustor's interface feels more refined and forward-looking than some of the long-standing competitors. 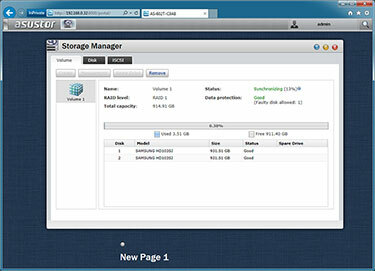 Considering it's at version 1.0, ADM is a NAS operating system worth keeping an eye on. The software is good, but does the AS-602T deliver the performance to match?